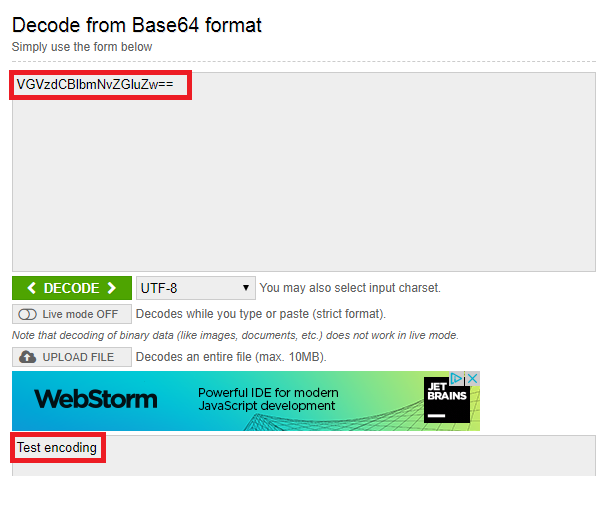 The objective of this post is to explain how to perform base64 encoding on strings, using the Arduino core running on the ESP32. Important: At the time of writing, there is a bug on the base64 encoding library that resets the ESP32 on certain strings. You can track the bug on GitHub here. In order for us to be able to use the base64 functionalities available in the Arduino core, we need to first include the base64.h library. Moving to the setup function, we will start by opening a Serial connection, to output the results of applying the base64 encoding. Next we will declare an arbitrary string to be used in the encoding. In order to apply the base64 encoding to the previously declared string, we simply need to call the encode method of the base64 class. This method receives as input the string we want to encode and returns the base64 encoded result, also as a string. Note however that the encode method is a static method. Thus, we don’t need to create an object of the base64 class to use it. So, we can simply use the class name and the C++ scope resolution operator (::) to access this static method. Finally, we will print the result to the Serial port, so we can analyse it upon running the code. You can check the final code below, which already includes this print. To test the code, simply compile it and upload it to your ESP32 using the Arduino IDE. After the procedure finishes, open the IDE Serial Monitor. You should get an output similar to the one shown in figure 1, which has the base64 encoded result. We can confirm that the result is correct by decoding the output of our program on this online tool. You should get the original string, as shown in figure 2. NOTE: This esp32 tutorial is written by Nuno Santos who is an kindly Electronics and Computers Engineer. live in Lisbon, Portugal. you could check the original article here. I have used base64 many times in ESP8266 projects very nice and well accepted across platforms for data transfer. Hope they find the bug in the Arduino library. Which ASCII characters are used for the encoded output?